AIDAN (AEDAN), Our father among the saints Aidan of Lindisfarne, Enlightener of Northumbria, was the founder and first bishop of the monastery on the island of Lindisfarne off the northeast coast of England. He is credited with restoring Christianity to Northumbria (Northern England). intercede for us sinners that Christ our God may have mercy on our souls. faith throughout Northumbria, O holy Hierarch Aidan. St. Aidan was a native of Ireland, possibly born in Connaught, who became a monk at St. Columba’s (9th June) monastery on Iona. Known for strict asceticism, St. Aidan staunchly defended Celtic practices against the imposition of Roman ones. During King St. Oswald’s (5th August) exile, he became friendly with the monks at Iona, and when he sought missionaries for his kingdom, he naturally turned to Iona rather than Canterbury. 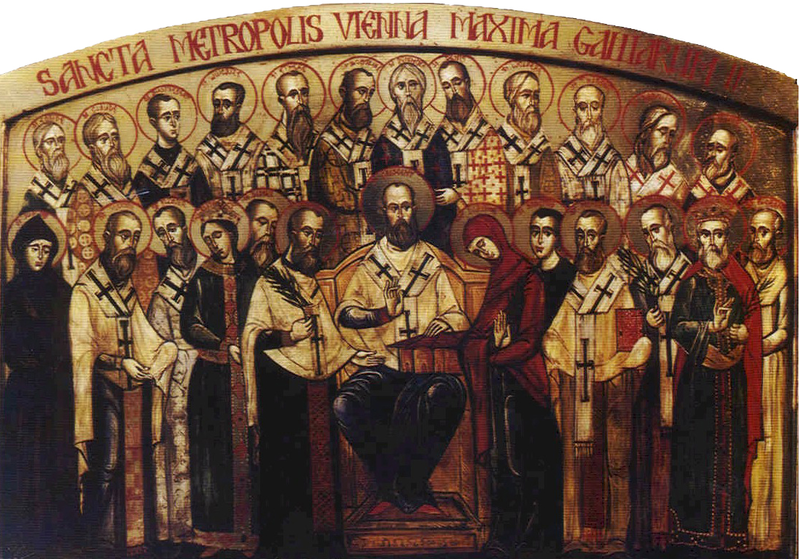 The first bishop sent to lead the mission was too stern, and this alienated many people. St. Aidan was then consecrated bishop and sent to Northumbria to take charge of the mission. King St. Oswald gave him the island of Lindisfarne, near the King’s castle at Bamburgh, for his episcopal See, where St. Aidan later founded the famous monastery of Lindisfarne. St. Aidan proved to be an inspired missionary, walking from village to village, though according to one legend King St. Oswald gave St. Aidan a horse so he would not have to walk, but St. Aidan gave the horse to a beggar. On these travels, he would engage people in conversation and slowly interest them in Christianity. Since St. Aidan did not initially speak the local Saxon language, King St. Oswald, who spoke Gaelic from his time in exile, often travelled with St. Aidan, acting as interpreter, thus playing an active role in the conversion of his people. Through these simple conversations, St. Aidan and his monks slowly restored the Christian faith to Northumberland. St. Aidan also selected twelve local boys to train at his monastery, including the future St. Chad (2nd March), thereby ensuring that the future leadership of the local church would be English. Though St. Aidan followed the Celtic, rather than the Roman practices, which were then vying for supremacy in the region (see Synod of Whitby), his character and energy as a missionary earned the respect of several of the Popes of Rome of his era. St. Bede the Venerable (25th May), in the Historia Ecclesiastica , praises St. Aidan for his humility and piety, recommending him as a model for other bishops and priests to follow. He also wrote a Life of St. Aidan, thus preserving this important part of the history of the Church in the British Isles. The Life told of miracles attributed to St. Aidan. It is said that St. Aidan once predicted a storm at sea, and gave the sailors who would be caught in it some holy oil to pour on the water which calmed the storm. Also in 651, when a pagan army attacked Bamburgh and attempted to set its walls alight, St. Aidan prayed and the winds turned, blowing smoke and flame towards the pagans, causing them to flee. 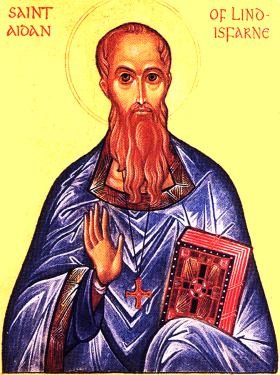 St. Aidan reposed at an unknown age in 651. It is said that at the moment of the saint’s repose, a young shepherd boy named Cuthbert had a vision of the St. Aidan’s soul being carried up to Heaven by angels. This inspired the future St. Cuthbert (20th March) to dedicate his life to God and prepare to receive monastic tonsure. BARBOLENUS, the fourth Abbot of Bobbio Abbey (Abbazia di San Colombano) in Emilia-Romagna, he reposed circa 640. CAESIDIUS and COMPANIONS, St. Caesidius was martyred with an unknown number of Christians the Fucine Lake (Lago Fucino – about 100 Km / 60 miles east of Rome) during one of the third century persecutions. Some traditions state that he was the son of St. Rufinus (11th August). CUTHBURGH (CUTHBURGA) and CWENBURGH, a sister of King St. Ina of Wessex, St. Cuthburgh was betrothed to Oswy of Northumbria. She desired to enter monastic life and Oswy released her from the betrothal and St. Cuthburgh received monastic tonsure at Barking Abbey under St. Hildelith (24th March). St. Cuthburgh, along with her sister St. Cwenburgh, went on to found the great Abbey of Wimborne in Dorset, England, where SS. Lioba (28th September), Thecla (15th October), and many other great and saintly women were trained. Many of these women went on to help St. Boniface (5th June) to enlighten the German people. St. Cuthburgh reposed circa 724 and was succeeded by her sister St. Cwenburgh as abbess. EANSWITH (EANSWYTHE), (Seventh Century), St. Eanswith was the only daughter of King Eadbald of Kent and his Frankish wife Emma. At the time of St. Eanswith’s birth, her father was a pagan, her mother a Christian, and St. Eanswith was baptized and raised as a Christian. This is consistent with her desire from early childhood to enter monastic life. As she grew, St. Eanswith continued to insist on becoming a nun, even asking her father to build a cell for her where she could pray. Nevertheless, King Eadbald wanted her to marry. Eventually, the King realised the futility of his wish, and built a monastery for St. Eanswith in Folkestone in Kent. 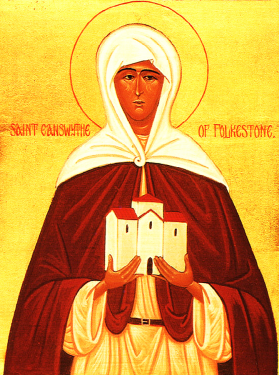 This was the first women’s monastery to be founded in England, and there, from the age of sixteen, St. Eanswith lived with her companions. Due to her age, she was not made abbess immediately, though there is no other recorded abbess. It is assumed that the community was guided either by members of St. Augustine’s (27th May) mission, or by a few experienced nuns who had been especially sent from the Continent, until St. Eanswith and the community were ready for her leadership. Many miracles are attributed to St. Eanswith during her lifetime, including the restoration of sight to a blind man, and the exorcism of a possessed man. We know little else of St. Eanswith’s life. According to tradition, she reposed in 640, when she was in her mid-twenties. Unfortunately, her monastery was sacked by the Danes in 867, though St. Eanswith’s relics were saved, and for some time were kept in the local church of SS. Peter and Paul. The monastery also had to contend with the encroaching sea, which required several relocations further inland. In 1138, a new monastery and church, dedicated to SS. Mary and Eanswith, were built farther inland, and St. Eanswith’s relics were translated from the church of SS. Peter and Paul to the new monastery. During the Dissolution of the Monasteries (1536 - 1541), the monastery was plundered, and the shrine of St. Eanswith destroyed, but her relics had been hidden beforehand. In June 1885, workmen in the church discovered a niche in the wall, which had been plastered over. Upon removing the plaster, they found a reliquary made of lead, which, judging by its ornamentation, dated from the twelfth century. A number of bones found inside were determined by experts to be those of a young woman. Today the niche is lined with alabaster and is covered by a brass door and a grille. Following the uncovering of St. Eanswith’s relics, they were brought out each year for veneration on the parish Feast Day. Unfortunately, this practice came to an abrupt end after several parishioners accused the vicar of “worshiping” the relics. Although St. Eanswith’s relics are no longer offered for public veneration, candles and flowers are occasionally placed before the brass door where they are entombed. of the royal court, set herself boldly to acquire all the virtues. OPTATUS, commonly reckoned the thirteenth Bishop of Auxerre, he reposed circa 530, in the second year of his episcopate. No further information on his life is extant. PAULINUS of TRIER, the sixth Bishop of Trier, succeeding St. Maximinus (29th May), whom he had accompanied to Trier from France. St. Paulinus was one of the leading Gallic defenders of orthodoxy against Arianism; steadfastly supporting St. Athanasius at the Council of Sirmium (351). As a result, at the Council of Arles (353) St. Paulinus was exiled to Phrygia in Asia Minor, where he reposed circa 358. The relics of St. Paulinus were translated to Trier in 395, and entombed in the crypt of St. Paulinskirche (St. Paulinus’ Church), which was dedicated to him. ROBUSTIAN and MARK, (Date Unknown), martyrs who have been venerated in Milan since time immemorial. Though the do appear in early Calendars of the Milanese church, nothing is now known about them, and it is possible that this St. Robustian may be the same as the one commemorated on 24th May.